Wow! I finally beat the benchmark - the first time since I started tracking my investments against a benchmark 4 months ago. I don't know whether to celebrate or cry because my investments have not performed anything like I orginally expected against a benchmark. I sold 100 shares of IBM stock from my ESPP at $123/share. This was to raise a bit more cash for our house buying fund and I feel IBM is no longer grossly undervalued. I continued to add to our positions in Wachovia and the KBW Bank Index ETFs as their share values continued to fall. 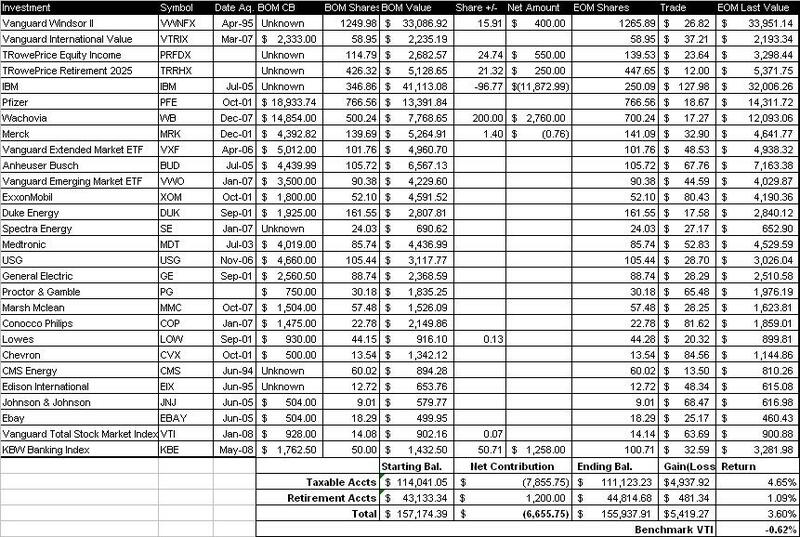 I invested an extra $400 above the $400 automatic monthly contributions to my wife's Roth IRAs to help us catchup on our annual contributions for 2008. ..."I don't know whether to celebrate or cry because my investments have not performed anything like I orginally expected against a benchmark...."
2mil - since I found your blog a couple years ago I've been begging you to switch to a 100% index fund portfolio. Your experience of underperforming the benchmarks will continue to haunt you as long as you perceive yourself to be a stock picker. Any bets on the next time MM will post his net worth update? I think his picking prowess has let him down. Since no one can ever teach themselves to become expert stock pickers, the time could be invested much, much more productively in other pursuits. Remember when I so eloquently stated the irrefutable evidence regarding your WB position and how it was going to continue to slide down to under 10? You are so far under with that dog you should seriously consider letting a professional handle your finances. Just a casual glance at what you call a "portfolio" is enough to make my stomach upset. Seriously man, you should purchase some investment books if you are going to continue to make "value" buys to average a ridiculously dead position down. You are making some bonehead decisions in one of the BEST corrections in our lifetime by pumping more liquidity into retirement accounts. Geez, tough crowd with the comments. I hope "IBM is no longer grossly undervalued". I bought some a couple months ago. @ concerned - how has your portfolio performed vs. the benchmarks? My concern for 2mil (and every other investor who pursues an active strategy) is that they will overtime the market substantially over their lifetime, and waste much irreplaceable time. What are IBM's long term prospects? What is their main business these days? Consulting? CPA1298: I'm absolutely slaughtering indexes by having bet against ALL major ibanks and financial services firms...My trading account is nearly + 51% since January because I've not went long on ANYTHING. I have a hard time understanding value investors like 2million who constantly buy with no intention of selling, and who choose to average down in worthless pieces of trash like WB. With complete disregard for market forces and the macroeconomic climate, he knowingly BOUGHT MORE instead of liquidating and taking a tax loss while things continue to sputter. I liken the personality to a compulsive gambler that keeps pumping money in to a game he is losing and wondering where all his money is going. Same principles, and LESS of a chance for him to come out ahead. As far as your comment about "overtiming", I politely disagree. It doesn't take a genius to recognize the entire US economy is crumbling for a multitude of reasons that will not suddenly disappear. There is still far more downside to go before we're out of the woods. When the dow hits 10000, THEN value investing becomes a reasonable alternative to shorting everything under the sun. 2 Mil - Have you considered modifying your benchmark to include International and Bonds? Maybe a VTI + VEU + BND would be a more accurate target for you based on the allocations you consider most appropriate for your risk tolerance level? VTI seems to narrow a bogey given that you have International, Emerging, and Target Date (includes U.S., International, and Bond allocations) funds in you investment mix. Good luck and keep the update coming! CPA129 - you have certainly been an unwavering proponent of an all index portfolio. I think I have planted the seeds for expanding my portfolio for that, although it will take a while to get there -- I doubt I will sell off most of my existing holding in the near term for that, but future investments will tend to be in index investments unless there is something that compels me to invest (ie Wachovia). Once you factor in my 401k which is ~$140k of all index investments my portfolio has over 50% in index investments. Richard - yes IBM's business is primarily made up of consulting(services), software, and computer hardware - in that order with consulting being the largest portion of their business and software being the fastest growing. Golfer65 -- Yes tweaking the benchmark is on my todo list, but just haven't gotten around to it yet. @ concerned - I'm more curious how you've perfomed vs. benchmarks over the last 5 or 10 yrs. I'm proud of you for calling the financials. Obviously, shorting is a very aggressive (dangerous) move. @ 2mil - I apologize for always sounding so negative; your blog is inspiring to me and I plan on launching my own in the next few weeks/months. You are obviously intelligent and hard working, and I just think that your precious time is better spent than trying to pick stocks, which I feel is an unwinnable battle.